War in Syria has not only forced millions of people to flee their homeland, claimed hundreds of thousands of victims and devastated the country. Countless animals have also lost their lives. The few survivors have vegetated for many months, some even years, in bombed out zoos. Some people had the courage not to give up on them and supplied them when possible with food to keep them alive. For example in a recreational park close to the war-torn city of Aleppo. When Dr. Amir Khalil, a vet and long-time expert for animal rescue operations in war and conflict zones, heard about the fate of the animals close to Aleppo, one thing was clear: he would do everything in his power to save the 13 remaining animals from certain death. Months of preparation culminated in one of the most strenuous and protracted rescue operations ever carried out by FOUR PAWS. Support the 13 animals on their way to a life in appropriate conditions! This was an incredibly exhausting mission for all the participants from the FOUR PAWS family. In July 2017, a team of experts set out to rescue 13 animals from the 'Magic World' recreational park. In close cooperation with security experts in Turkey and Syria and with the invaluable backing of Turkish authorities we were able to safely transport nine of the almost famished animals to Turkey despite heavy fighting. Three lions (two females and a male), two tigers (a female and a male), two Asian black bears (a female and a male) and two hyenas were among the first survivors. 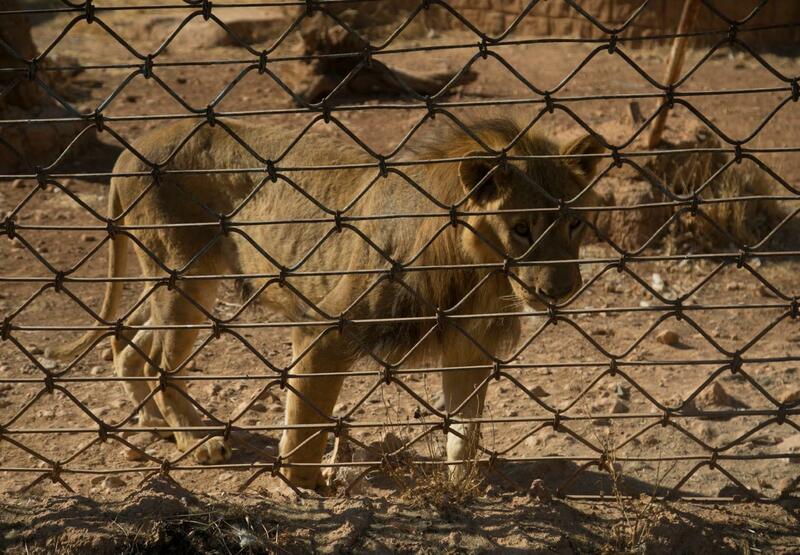 But four animals were still missing: two lions and two dogs, also kept in cages, held out in their barred enclosures. It was a logistical masterpiece on the part of all participants to prepare these animals for transport. Around a week after the first successful rescue operation, we were able to collect the last four animals from the zoo close to Aleppo on the Turkish border, starved and badly dehydrated. We owe big thanks for the success of our operation to the Turkish authorities who for our mission twice opened the border crossing to Syria for us and the animals. We transported the exhausted animals to an animal welfare centre close to the Turkish town of Karacabey where for a few weeks all 13 animals were able to recover from the strain of the rescue operation and above all from the trauma suffered during the war. Thanks to the support of Dr. Frank Göritz, the chief vet at the Leibniz Institute for Zoo and Wildlife Research (IZW) in Berlin and a long-standing FOUR PAWS partner, all the animals received veterinary treatment and were prepared for the further journey. Some three weeks after their rescue from Syria, the animals were ready for transport; we had received the necessary documents from the Turkish authorities permitting their export. The final journey of the 13 animals from Aleppo ended in Amman, Jordan, where they were released into the 'Al Ma'wa for Nature and Wildlife' sanctuary, which is funded by FOUR PAWS and the Princess Alia Foundation (PAF). For the first few months, they were kept in so-called resocialization enclosures that are much smaller than their final wildlife compound. This is a necessary step that serves to gradually familiarise caged animals with their new habitat.